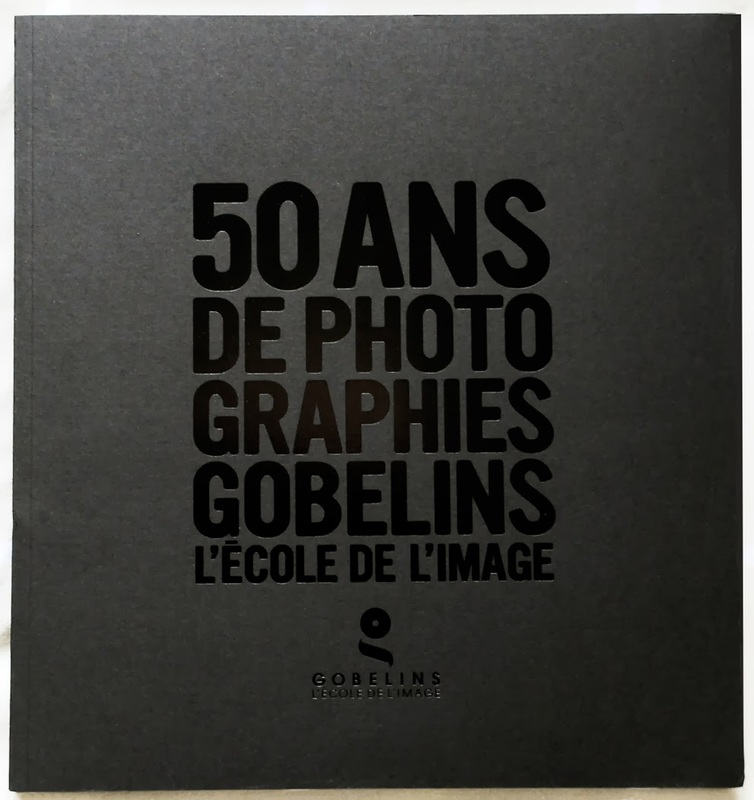 Very proud and happy to finish 2013 with a quality publication from the Gobelins School, Paris that turned me mid-90's into a fully skilled darkroom technician. I then moved a couple of years later to London and became a freelance photographer. 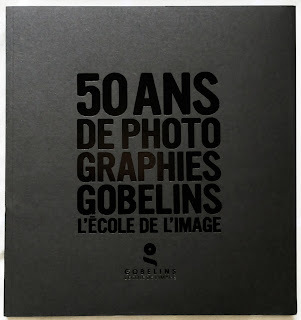 I am celebrating their 50 years successful anniversary with a lot of talented photographers sharing their vision and interests. I personally submitted my Boarrrds series which has never been published before. They selected my Blue, reds and double yellow lines picture which I love. This series has been produced randomly over few years and might be revisited in a near future, who knows. But just to say that most of it has been shot in East London and it does encapsulate quite well what the East is about. 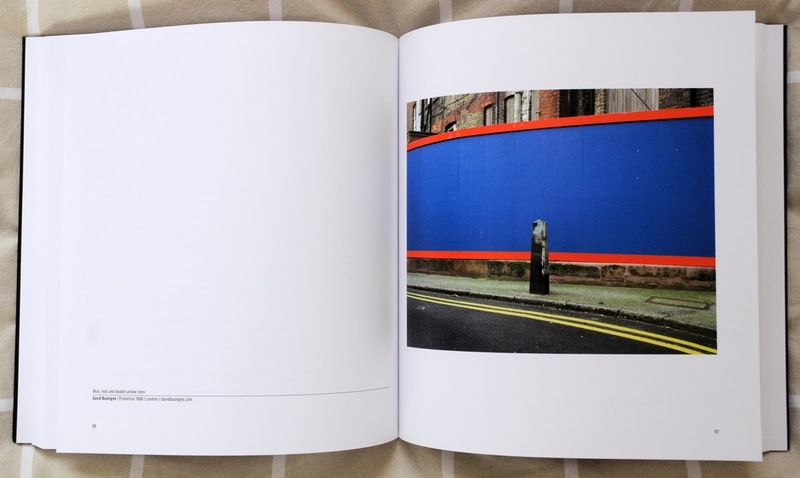 Continuum is an interactive book on the iPad that showcases photographer Chris Dorley Brown’s unique set of before-and-after photos of London spanning two decades. These pairs of photos with their identical framing of the exact same location, reveal the sometimes incredible and sometimes subtle but always present march of time. This interactive book provides an especially fitting means of experiencing this exceptional photographer’s particular view into the ways in which streets, buildings and people change over time. By tapping the subtle icon in the lower-left corner the “before” image fades into the “after” image. Tap repeatedly to toggle back and forth through time. Scroll vertically to see both photos side by side, the years they were shot, and the photos’ caption. The book includes sixty pairs, or one hundred and twenty photographs, as well as a beautiful essay on this work by writer Stewart Home. 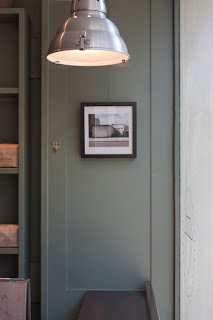 I can now officially announced that a catalogue has been produced to relive this almost one year residency project at the Workshop Coffee Marylebone branch. This is a free A4 format publication to grab with your coffee. It will be available this week and we have a 1000 copies. Feel free to take one, or more, before the Christmas rush. This initiative wouldn't have been possible without the generous contribution from our host. Many thanks again and enjoy the read. In the next few days I will revisit the space and devise a collective show to complement this brochure. My own Stories from an autonomous space is titled Playtime in reference to Tati's last major long feature. The pictures are now hung and ready to enjoy with a coffee in Marylebone. 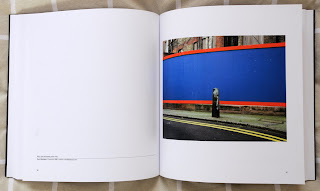 I have photographed the East-End from 2009 until early 2012 to analyze the shift experienced on the way to the recent London Olympics and gathered materials to be presented in various ways. Today I want to pay hommage to French film director Jacques Tati. Playtime was not only his masterpiece but also his downfall. Best known for his modern silent tales based on humour and nostalgia they also depict human activities in the most mundane scenarios. That said there is always a strong underlayer that questions modernity, politics and aspirations to a better world thanks to innovation, colossal developments and capitalism. I think the contemporary Olympian agenda would have been of a great inspiration for another Tatiesque feature where laughter is always around the corner. 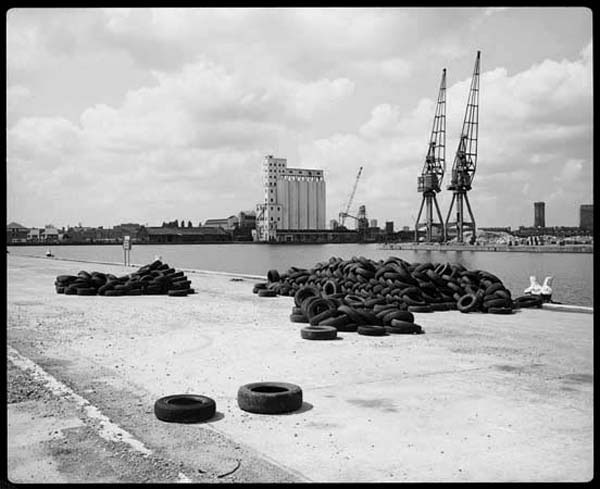 It was an immense pleasure today to hang photographs of the London Docklands with artist Mike Seaborne. Short stories from an autonomous space residency takes us back to the end of an era in black and white. Seaborne's pictures are cinematic, atmospheric and always surprising. By glancing at the ten prints you will be transported and captivated. With plans for redevelopment announced in the early 1980s, it was clear that London’s Docklands was soon to be transformed. Although the docks had been disused for many years they were still largely intact and I realised that this was the last chance to document a significant part of London’s industrial landscape before it disappeared for ever. It saddened me that the great industrial heritage represented by the docks and the communities of people who had devoted their lives to this once essential part of London’s economy would be swept away and replaced by new service industries that local people would not be qualified to work in and new up-market housing that they would not be able to afford. 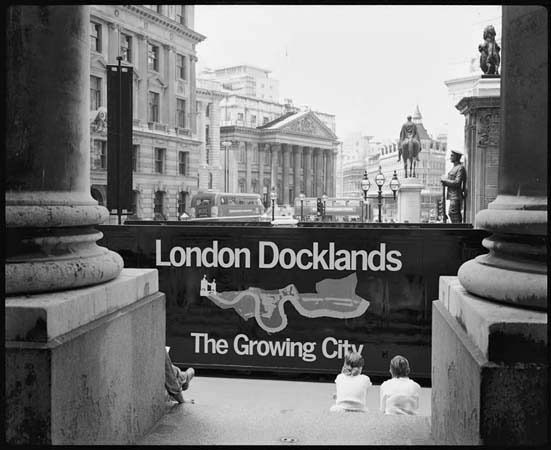 I am just coming back from the Museum of London Docklands. This my first visit to this new location and was quite excited to discover how the show would be devised. I was also very keen on seeing Peter Marshall's photographs. My reaction few hours after is actually more excitement than before stepping in. The exhibition space is great, convivial, intimate, surprising and has the perfect size. One work can also be found on the third floor, so this is very organic and entertaining. The show is described has being a selection of contemporary artists, and that description always worries me when it comes to this kind of museum. But very quickly it appears that they got it right as the mix of mediums is clever, appropriate and surprising. 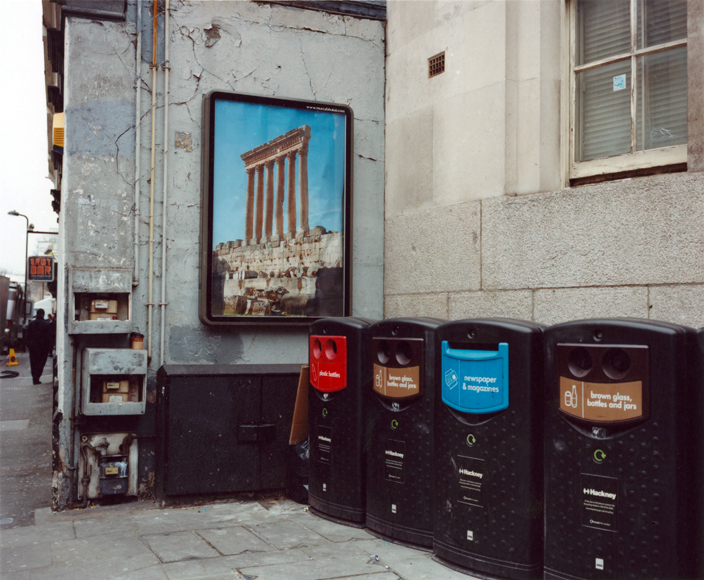 Peter Marshall's photographs are colour and panoramic. They present new property developments along the estuary and shore scapes in the ever growing London East End titled Thames Gateway 2000-04. Sharp, understated and revealing are his pictures. My best experience I have to say remains with John Smith's Horizon. It is a video of still frames 18min long. This montage of the sea in different states is in the continuity of Hiroshi Sugimoto's contemplation of nature's beauty mixing abstractions, minor events and sounds. This is truly one of the best experience I have had in years!!! I am still very surprised as why Mike Seaborne's stunning estuary colour landscapes are not present in this exhibition!? Just go there and enjoy, it is really worth it. 1/ Dear Mike, first of all I would like to know what drives you towards photographing the unwanted or forgotten London? 2/ The captivating landscapes you are collecting go further than depicting emotional stereotypes. How do you describe your approach? What are the key features or recurrences you have been able to notice at a later stage, or produced deliberately throughout the years? I would describe my approach as archaeological. I am interested in the landscape as evidence of human activity, past and present. The theme which has most concerned me is de-industrialisation and the negative social and cultural impact this has had. A certain amount of nostalgia is involved in this - tapping into people's innate sense of loss and a feeling of helplessness in the face of the immense social and cultural changes wrought by global capitalism. 3/ How would you explain best the marginal direction of your photography. This thought could be applied to most photographers engaged in the platform but I think you might be the perfect example of " how NOT to do it right" if you understand what I mean. That dilemma comes with whether you wish to capture and deliver what is in tune with the medias or art scene, or whether you take the alternative of producing over a long time period something which makes more sense when looking back. 4/ Do you have a photographic routine and what interest you most? 5/ Does your work relate to certain theories, thinkers or writers? Quite possibly, but as I don't read a lot of photographic theory I may not be aware of it. On the other hand, I do tend to take note of other photographers' images, ideas and experiences. My favourite quote is Bill Eggleston's "I am at war with the obvious". 6/ Would you say in some ways that your work is politically engaged? My thoughts here are more directed towards a philosophical discourse rather than an active and direct opposition? Definitely, yes. I want people to take notice of what is being destroyed in the name of progress. 7/ What is your relationship to the medium? Do you have other interests? Is there any burden with photography that you find solution from others? Sometimes photography seems like a huge burden, at other times it becomes the only purpose in life. My main other interest is classic cars - which I also like photographing! 9/ Finally, how would you describe what Photography is today for the ones that wish to make a career of it? I would say that photography is now almost dead as a documentary medium, having been replaced by a technology which is really only a simulation of it and so has little or no long-term cultural value. Everyone is now a photographer and because photography has become a craft-less technology with minimal user input, I can see no meaningful future in it as a career. 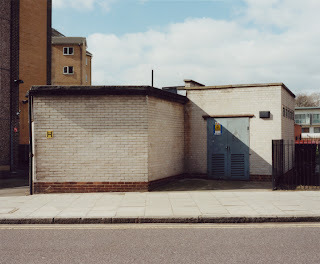 Our Shorts stories from an autonomous space take us to the Hackney Wick area in the coming up of the 2012 Games. Arnau Oriol Sanchez depicts real characters and unusual urban landscapes. The depth and colour of this series are not to be missed. Commissioned by the Hackney Museum this work looks at an area in transformation. Hackney is one of the four boroughs in London that hosted the 2012 Olympic Games. That fullfilled me with certain pride because being a resident it was a nice way to establish a relationship with a place I don’t belong to. I soaked the place, studied the work of some local photographers and read literature about Hackney. 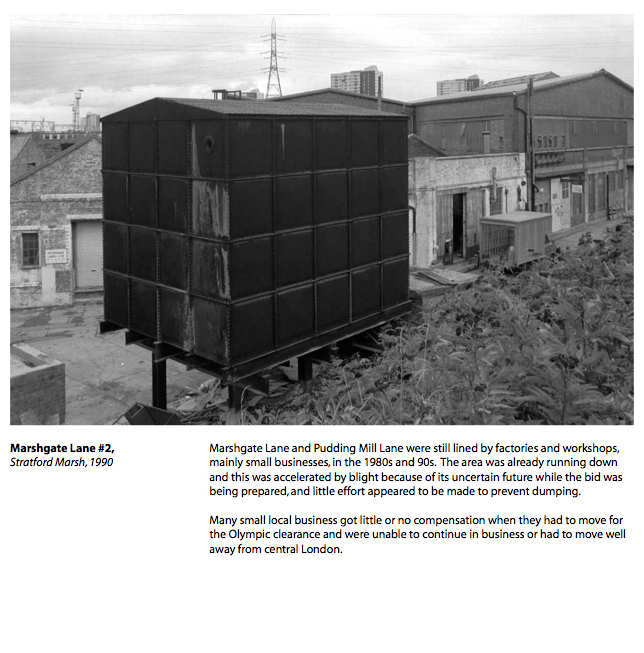 I realized that some of the odd and fascinating legacy of Hackney Wick was fading in front of my very eyes. Then I looked for images that could explain the transitional and ephemeral nature of that place. I also tried to capture the detached nostalgia. I am delighted to present as an exclusive Chris Dorley-Brown's Fogs series. 10 images are available for viewing at Marylebone Workshop Coffee & Co. Short stories from an autonomous space are now halfway through the year and we hope to have more to show you by the end of the year in a different format. Meanwhile our artist photographers will fill up the space individually and monthly as usual. The fog is primarily a mystery. Quintessentially British the mist evokes the drama. The former East End fog recognised as being produced by the now long gone heavy industries is taking a new role. Its gothic charm has never left our psyche and it thrives in invoking the working class and its tragedies. Chris Dorley-Brown’s Fogs are landscapes to be lost into. He depicts common architectures being absorbed by this atmospheric phenomenon. In return we re-focus on the history behind those walls and we wander the tarmac mentally. Chris’ Fogs aren’t simply an illustration but a field of study in which we become the central character. Because it is only in the state of being lost that we encounter our true dimension as individual. The Fogs series enable us to invest the East End in a personal quest. 1/ Hi Kajsa, can you present yourself please? Where are you from and what interests you? My name is Kajsa Johansson, I am 25 and born and raised in Gothenburg, Sweden. Apart from photography which I studied at both college and university I also enjoy listening to and finding new music, visiting art galleries, making DIY projects and fixing things, cycling etc. 2/ More than ever I would compare Photography to the act of writing. Would you accept this comparison? Sure, both in more serious situations like in newspapers and in televised news broadcasts as well as in more informal medias such as on blogs and in advertising, I would say that images are increasingly being used to convey a certain message. It is possible to get an idea or a piece of information across faster by presenting an image which can be "read" more quickly than text if it is aptly constructed. The premise of photography being a form of writing could also be applied to when images are put in a specific order creating a narrative or story-line. Personally I would use this while putting together an exhibition or a monograph since I think different stories can be told if the sequence of the images is re-arranged. 3/ Could you describe what sort of Photography you are doing or attempting to develop? Do you have obsessions whether visual or aesthetical? Is building a visual identity of yours something you strive for? Do you think that there is a contemporary pressure of looking different today? My photographs are what I see. When I am walking around it is as if my eyes are seeing frames in the scenery that I then catch with my camera. I use a handheld rangefinder camera so all of my photographs are literally captured from my eye level. One obsession of mine is my love for traditional techniques. I always shoot on film and have during the past few years been doing my own printing in a colour darkroom. I prefer these classical ways of photography because they are more of a craft. I like working with my hands as I find that the physical handling of my art makes me understand it better in the aesthetical sense. The entire process from when I press the shutter release button to when I am holding the final print in my hands is tangible in every way. I believe all photographers and other artists are looking for a visual "voice" or identity that can be recognised. In regards to the pressure of looking different in today's photography scene I think it is all about showing confidence. In the infinite jungle of images we are all being exposed to through media today I think many might feel overwhelmed. If you trust in what you do that will show through your work. 4/ Your Considering Corners really touch me for their simplicity and honesty. But more than that I related to the images for their beauty and suspension. I felt a similar approach to one of my earlier works titled Henorama where all the senses of the artist are alert whilst discovering a new environment. Could you explain that experience and do you think you would be able to photograph the same elsewhere? As I have mentioned I make photographs of what I see. Often it is of strange or unusual situations, objects that don't seem to fit into their surroundings, things that are lost, misplaced or forgotten. A lot of the time there is a quite dark sense of humour in there too. The places in the photographs make little worlds of their own. They are places that most people overlook because they seemingly have no value. I don't wish to point out to viewers "look at this! ", I am merely showing that these glimpses of landscapes exist. These are the things I see when I wander the streets, and I don't think there is much underlying suspension. There is little mystique, the places are what they seem to be. While on an exchange term in New York I lived in an area in north Brooklyn called Greenpoint where I made a project pre-Considering Corners. I did the same thing there where I walked every street multiple times, always aimlessly and turning a corner whenever my intuition told me to. This summer I will be moving back to Gothenburg where I aim to continue this particular trajectory of photography by again wandering the streets without a set plan and see where I end up, both geographically and artistically. Seeing as I know my hometown very well I am intrigued to see if I can look at it with the same fresh eyes as I did in New York and London. 5/ Could you explain your practice for this series? Considering Corners was my final major project at my BA Photography course at Middlesex University. We had over six months to complete the project and I went through some different approaches and directions before ending up with a finished project. In making Considering Corners I walked every single street around my area in Hackney up and down and on both sides of the road. Not only did I get a full experience of the layout and feel of the borough but I got to see all its nooks and crannies which is essentially what interests me in any given place. When I am making a photography project, it is a process. I set out by taking photographs while walking the streets of a certain neighbourhood. I then go through the whole developing process until I have a couple of printed images to look at. I need to go through this entire procedure from time to time when I'm producing a project or I won't know where I am, I won't be able to get an overview. When I look at the prints I can decide how to proceed, and in which direction I want to take the project for it to end up in a well edited and cohesive series of photographs. Again and again I will lay out prints and try different edits and sequences. 6/ How would you relate the format, or equipment used, to your approach? I am using a Mamiya 7 Rangefinder which creates 6x7 medium format negatives. As mentioned this camera enables me to photograph handheld which is my preferred method as I feel using a tripod slows me down, I would rather keep my camera on my shoulder and be able to snap whatever catches my eye as I see it, when I see it. Also, by using a tripod I mostly seem to physically drop my gaze down to a lower level, which is not how I perceive the world around me. To get more technical I really love this camera for the amazing sharpness it generates, the 80mm lens is my favourite because it is very close to how the human eye views its surroundings, the camera is light and quiet for its size and I not only have the privilege to own one but have been able to use this kind of equipment for over two years which I am convinced has affected the way I make photographs. 7/ Are you working on something new? Do you work on several projects simultaneously? How spread are your interests and how do they merge in your work? I am currently working on a few different projects. One relates to Hackney specifically, especially the postcode area of E8 where I live focusing on the gentrification, the co-existence of new and old, and on its inhabitants. The other projects all revolve around the urban landscape, its architecture and people. I am also excited to start a new project when I move to Gothenburg, shot in the same style as Considering Corners and Greenpoint. A series of images that I hope can be compared and contrasted to the two previous works and what they may say about these cities. 8/ Any last word or message you would like to share? Photography is a process of learning through success and failure. Especially when using analogue photography there is no knowing where you are or will end up in your project until you have the prints in front of you. Shoot, try different angles and directions, both literally and figuratively speaking and you might find something you didn't know you were looking for. SHORT STORIES FROM AN AUTONOMOUS SPACE residency this month presents young Swedish photographer Kajsa Johansson with her Considering Corners series. It will be interesting to see how the West End responds to the very poetic works whilst presenting views which are not commonly understood as idyllic. This series is definitely a must in our collection to engage a discussion towards contemporary photography with a wider audience. 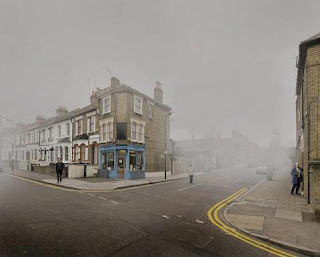 Considering Corners is a series of photographs depicting scenes from Hackney that I believe most people overlook or rarely notice. They are glimpses of the urban landscape showing places and objects that seem misplaced or forgotten and one might start to wonder why they are there or where they came from. These sites connect the dots between places of higher value in the cityscape and are quiet little worlds of their own to contemplate. With their subtle humour they become rare treasures to get lost in. 1/ My first question might be a bit of a classic but I would like to know what brought you to Photography. Who are your icons and can you explain why? 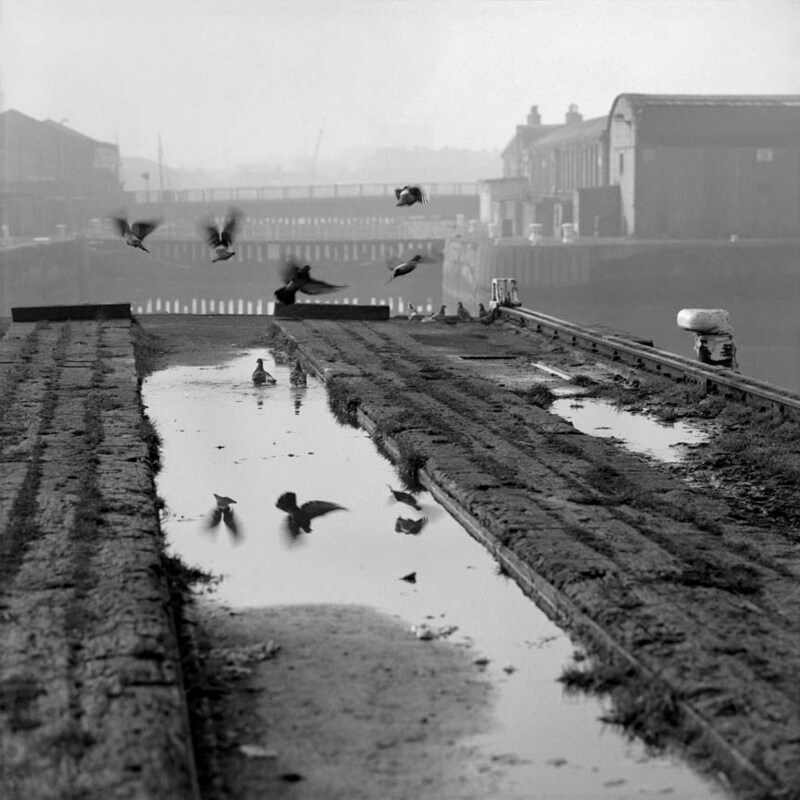 I started taking photographs when I was quite young and then abandoned it for a while. The school I was at when I was 10 had a darkroom and I spent lots of time messing around, it was pretty magical. Then I moved school and forgot about how much I liked photography for a while. Years later I ended up at art college doing a degree in Fine Art Sculpture, I started taking photos again as way of researching and then documenting sculptures. Gradually my interest in photography began to take over and I became increasingly interested in story telling. I got really into William Egglestone and the New Topographics like Sternfeld and Shore, I’m still fascinated by their photographs. And I’m really interested in artists who deal with conflict and post-conflict spaces; Simon Norfolk, Broomberg and Chanerin, Sophie Ristelhueber, Paul Seawright, Donovan Wylie. 2/ Looking at the subjects you have dealt so far with can you explain how time is relevant to your methodology? Lots of my work explores the layers in a landscape, the idea that events become imprinted in a place even if there are very few visual clues remaining. The work I made in Northern Ireland was looking at visual histories were being erased, yet a sense of what was there before remained. As a photographer I try to bring out that emotion within a place by shooting in a certain way. It’s quite manipulative, you are bringing something to the photograph to convey a sense of history and meaning. I’m interested also interested in repetitive histories. For example how borders remain in the same place across a 1000 years. It’s something Peter Ackroyd writes about a lot and with the Ring of Steel project I found it fascinating that there was this consistent border which had remained during a time period of a thousand years, becoming increasingly less visible but still very present. 3/ In the follow up of my previous question, can you define your reasons, as much emotional as technological, why you choose to use film when photographing? I do continue to use film a lot, particularly large format because I like the very long exposures that you can impose upon the photographic process. I’m less interested in freezing action within the frame. A long exposure helps to give a sense of time passing and being liquid. Particularly if you are shooting in the half light, which I tend to do. But I also have did a project entirely on my Iphone [The Secret Security Guard was an undercover project] and I shoot video on the 5D Mark II for other projects. So I’m not stuck to film, I like to choose the medium according to what works best for the subject - both conceptually and practically. And I also use writing and mapping as other ways to explore projects. It might be something that comes out of my background in Sculpture. Each project that you do can use something entirely new, so you have to keep learning and adapting, but that stops it from becoming repetitive. 3/ Your interests are diverse and thoroughly approached. Whether you are using your still camera, video, sound recording or writing skills you always intend to get closer to the core of your subjects. At the same time you successfully manage to keep a certain uncertainty and autonomy in the result. Could you explain how this complex alchemy works? I’m really turned off by photographers who make work that forces me to feel a certain way. I prefer projects that ask questions and get the viewer to engage with a subject in a new way, but don’t lay it all out in black and white. I don’t believe the world is a simple as that, it’s the shades of grey I’m interested in. I want to make work that asks questions rather than gives all the answers. That’s the aim anyway. 4/ You are an engaged artist, or an artist who is not afraid to document the right to protest. What do you think about the state of documentary photography today when it comes to express an idea? Is the photographic image still immune from a dialogue as it has been the case for quite some time now? I’ve always seen photography as a medium to get across an idea. I don’t think it’s immune from dialogue at all. It’s just like a writer putting their thoughts across in words, it’s still a biased view that has been manipulated. What’s interesting about photography is that you can put two photographers at the same event and their images will look completely different and tell a completely different story. I think documentary photography can be a really useful tool to express ideas, but sometimes it’s not the right tool. Then I’ll use video or writing. Or any other medium that seems appropriate. I’m most interested in the ideas behind the story, not the surface image. Although I do think the beauty of an image is important. Otherwise you can just use another tool. 5/ What do you think of the single image dilemma and complexity? Thanks or because of today's accessibility to the medium, do you think we are facing an impossible task by trying to persevere in Photographing? If not, what does the still image mean to you and do you think there is a whole unknown world to be embraced with the medium? Commercially we’re already seeing video replacing still images, purely because we experience so much of our lives through the internet now. Online lends itself far more to moving image. I think that’s exciting and I’m exploring it. But I will always love the process of using large format cameras and film. It’s completely inpractical but there’s a quality to the images that is totally unique. They become objects once you print them, a sort of compression of a moment in time. But increasingly it feels to me like still images are for galleries, there’s isn’t going to be the breadth of outputs anymore. Everything changes, we just have to keep up. 6/ What makes you happy - apart from motor-biking around? 7/ To conclude, is there any new artist or discovery that made your head spin recently? I’m getting really into film at the moment, particularly documentaries. I loved 5 Broken Cameras, I want to make a film like that. David George is now occupying the space at the Marylebone Workshop Coffee & Co. branch with the Persistence series. All the square images reveal the ghosts of a derelict building in the East End. Those images are simply beautiful and romantic. They succeed in revealing different timescales at once and produce some strange appeal. Here is David George' statement for this month SHORT STORIES FROM AN AUTONOMOUS SPACE. I am interested in how photography informs memory, history, and reminiscence, forming new, imagined places captured with a camera. Memory is fragile and infinitely corruptible. Photographs, by the nature of their believed subjectivity, allow the real world to be reinvented and remembered in different ways. This is dependent not only of the re-imaginings of the photographer, but also on the status of the viewer and their relationship with places and their essence. This series of images, all taken in the East End, reveal buildings in that liminal place between use and demolition. Although abandoned for many years these places still manage to hold onto their identity, their reason for being still persists and pervades the architecture with clues of former occupations. At the same time it allows the viewer to create new personal stories. My photographs aim to depict neither a real world nor a fantasy world but somewhere between, a world of myth and melancholy. This is the turn of Peter Marshall to have his work presented at our residency space in Marylebone. Our SHORT STORIES FROM AN AUTONOMOUS SPACE project is today called Before the Olympics. You will find a new selection from Marshall's long experience of the East End to which he added a consistent text to read along each image. 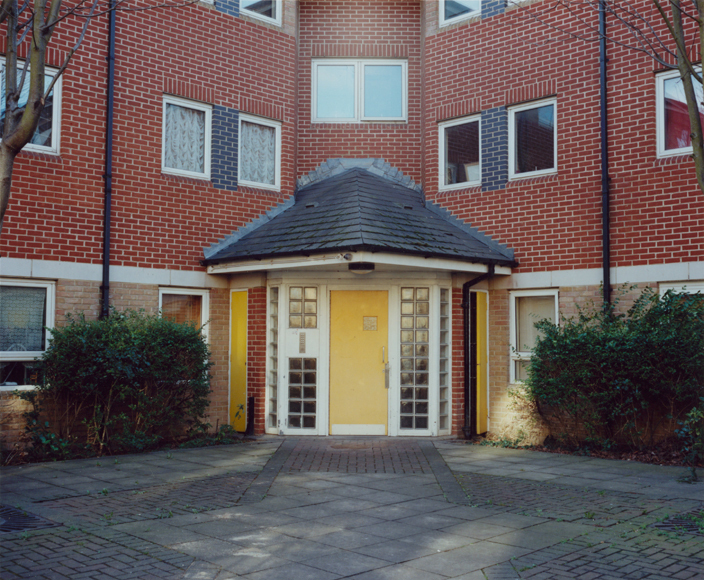 In 1981 I began a long-term photographic project in the Lea Valley from the source of the river to the Thames at Limehouse and Bow Creek, concentrating on the urban changes which were taking place and have continued. As a part of this project I photographed the busy industrial area of Stratford Marsh and around the Bow Back Rivers, returning in the 1990s and the early 2000s and again after the Olympic bid was announced and then won, recording as far as I could it’s transformation from a productive area to the urban wasteland with scattered monumental structures it is today. I hope to continue the project to record the legacy of the Olympics when the area will be hopefully be returned from behind its high security fences to more productive use as a part of a wider project on urban development in East London. I am looking forward to seeing Henrietta Williams latest work at the new TINAG festival. Following our last conversation I can say that Williams has kept those materials on hold for a few months as she was also reporting for a national newspaper undercover. Today she can display freely those rare and somehow recent documents. It will certainly engage criticism and broad discussions in the most progressive and intelligent festival available in London. We will hopefully discuss its content soon in an interview. This year the festival is taking place at the Bishopsgate Institute EC2M 4QH Liverpool St. The Olympic Games held in London in the summer of 2012 marked a shift – a rubicon in the way our city operates. 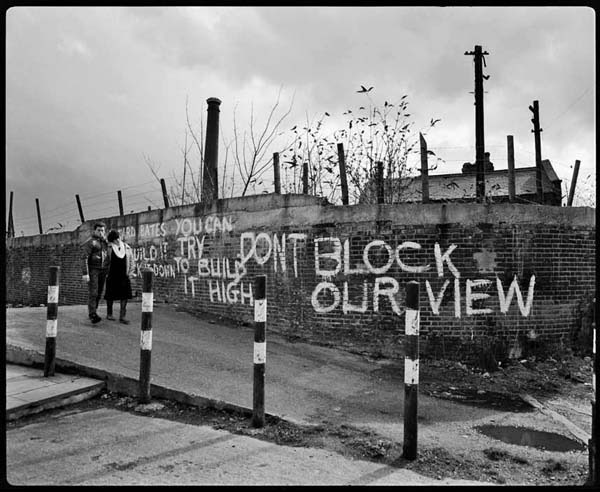 The army patrolled the streets, missiles were placed on rooftops, battleships were moored on the River Thames, surveillance blimps monitored us from the sky above, protests were banned and 30,000 new CCTV cameras were installed. Within this State controlled environment companies specializing in security and defence reported a massive increase in profits. None more so than G4S, the largest private security company in the world, employing 657,000 people in 125 countries. 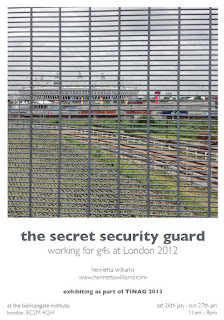 G4S were awarded the £284 million contract to deliver security for London 2012, with chaotic consequences. 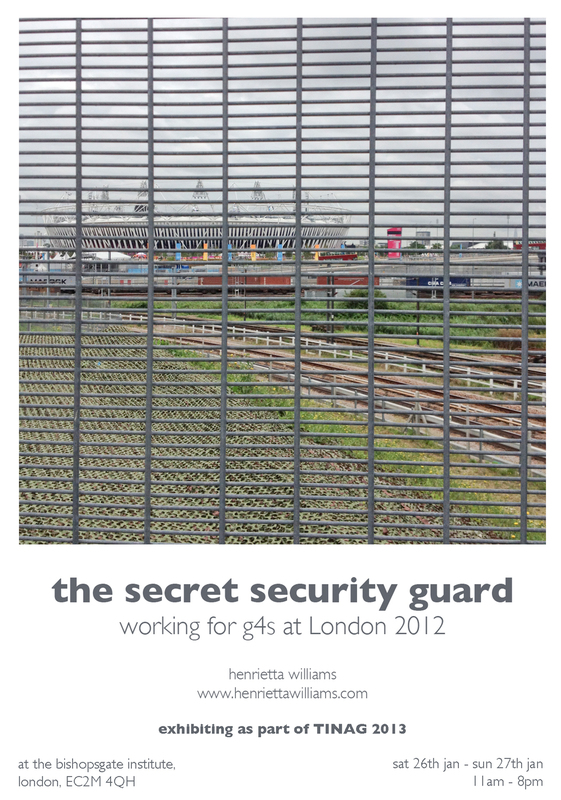 Henrietta Williams interviewed with G4S in January and, after training in March and July, ended up working as a security guard and x-ray screener based at the Olympic Park in Stratford for the duration of the Games in July and August 2012. Alongside fulfilling her duties for G4S she also worked as an undercover reporter for the Guardian writing a column called ‘The Secret Security Guard’. Henrietta also consistently photographed her shifts covertly on her iPhone. Exhibited alongside artifacts from the job, this body of photographs shows a world of mundane chaos behind the scenes of the Olympics: recruits being trained in methods of restraint; deployment alongside the army at the Olympics; the monotony of guarding and working the x-ray screening machines; images of the fortification of the Olympic site; and the haunting emptiness of the park on night shifts. These are images of people dressed in G4S uniforms playing at being security guards – a moment in time when hyper-security became normal. Workshop Coffee & Co. has kindly accepted to offer our collective a rotational residency for the next 10 months at least. Each artist is being asked to use the same frame format and to re-visit their works to tell a new story. 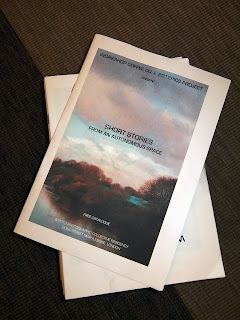 This project is titled SHORT STORIES FROM AN AUTONOMOUS SPACE and the first photographer to invest the space is Dominik Gigler with The River Lea from source to mouth. "This photographic project follows the River Lea from its origins in Leagraves, Luton (51.910338°N 0.461233°W) to when it meets with the River Thames in London (51.507113°N 0.009184°E). On its 68kms journey it keeps changing its face from rough to romantic and back. Many stories are told about the people who live along it and the industries that shape the look of the environment. Two years before I started this journey London had been announced host City for the 2012 Olympic games. In 2007 the main area of development, which is now the Olympic Park, was cordoned off. The day before, I went in and photographed the river which runs through the area. The Games are now over, the River Lea keeps changing its face. It’s an ongoing project... "
Great little experimental project, stunning prints and divine coffee. Enjoy!